This universal smartphone rig can easily adjust to clamp onto your phone. Use the smart rig as a handheld grip for more stability or mount your smartphone to a tripod using the 1/4"-20 standard thread on the bottom on the rig. 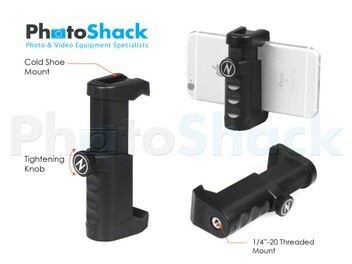 The top of the smartphone rig features a standard cold shoe mount that can be used for mounting a variety of accessories such as microphones and lights.